The garden is ablaze with the colour of many azaleas. Amongst all the colour there are some rare beauties to be found. The famous Davidia involucrata also known as the dove or handkerchief tree. The Davidia is a deciduous tree with vivid green leaves and the distinguishing bracts from which each flower is subtended. It is a native of central and western China and was first discovered by the Abbe David in 1869 but was not introduced to Europe until l897 when one seed was germinated. It flowered for the first time at Les Barres in l906. Magnolia sieboldii, also known as the Oyama magnolia, is a large wide spreading shrub, the nodding flowers are egg shaped in bud, are white, fragrant and appear intermittently from May to August. It is a native of Japan and Korea and was introduced in l865. 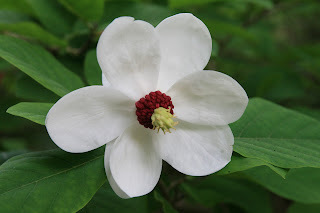 Unlike many Magnolias it will do well in chalky soil.